La Delizia was established in 1931 as a Cantina Sociale Cooperativa. 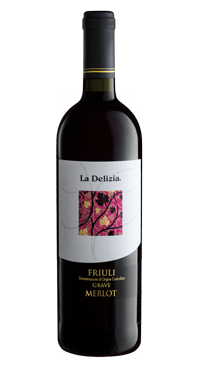 Today, Viticoltori Friulani La Delizia is the largest wine-making facility of the Region Friuli Venezia Giulia. .The production area includes a wide surface on the plain of the Friuli Region. In this land, well-known for its profound winemaking expertise, the nature of the soil and the particularly mild climate have contributed to create the best conditions for the vine growth. In Italy the Merlot has found its ideal setting in the Friuli Region. The colour is ruby red tending to violet. An intense, persistent and slightly herbaceous nose. On the palate, this wine is plush with well-balanced tannins. Ideal with stewed and boiled red meats; it can also be served with matured cheeses and cold cuts.